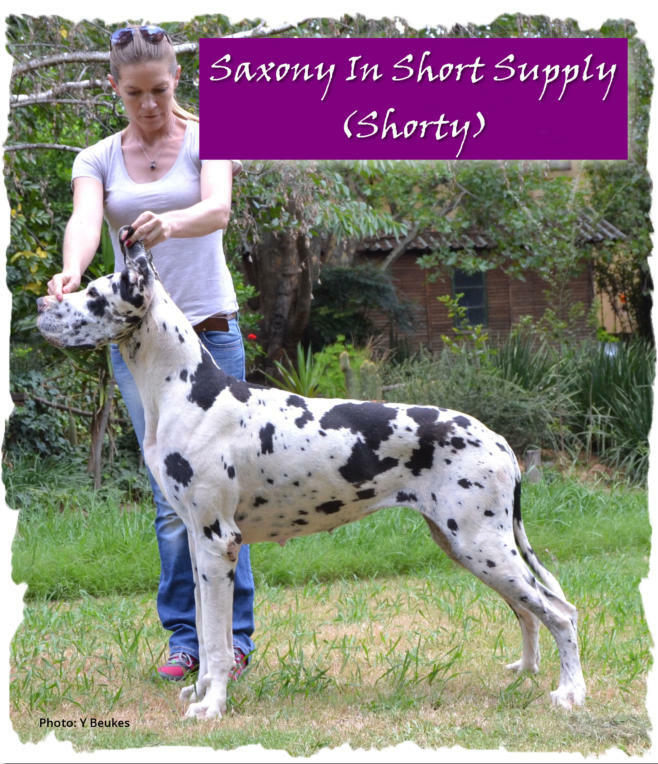 • Sire : Saxony Hi Lan Der B1/B1 ED00 • Dam: Carlu Eliada of Saxony C1/C1 ED00 Shorty arrived shortly before work and study took over our time, so she was not shown until nearly four years of age. She recently went to her first shows and decided this was not so much fun! Shorty was mated to Mervyndane Oxfordshire of Gavelle A2/A2 ED00 in Apr 2016 and she produceed our J Litter on 8 June 2016. For Shorty’s next litter we used the advantage of the recent developments in terms of genetic colour testing and extended the harl family genepool in South Africa by going across colour boundaries. Our strategy was well researched and notice has been given to the relevant associations. Shorty’s colour testing (Vet Gen USA October 2016) revealed that she is KK (homozygous black), DD (homozygous non-dilute) and SSp (solid/piebald). As Shorty is not carrying any colour recessives (as we suspected) she was thus an ideal candidate for this bold and exciting plan. The K litter was whelped on 19 Dec 2016 and the colours were exactly as predicted. All pups will carry either fawn or brindle and will only be put to colour-tested mates to ensure that no mismarks are ever produced.